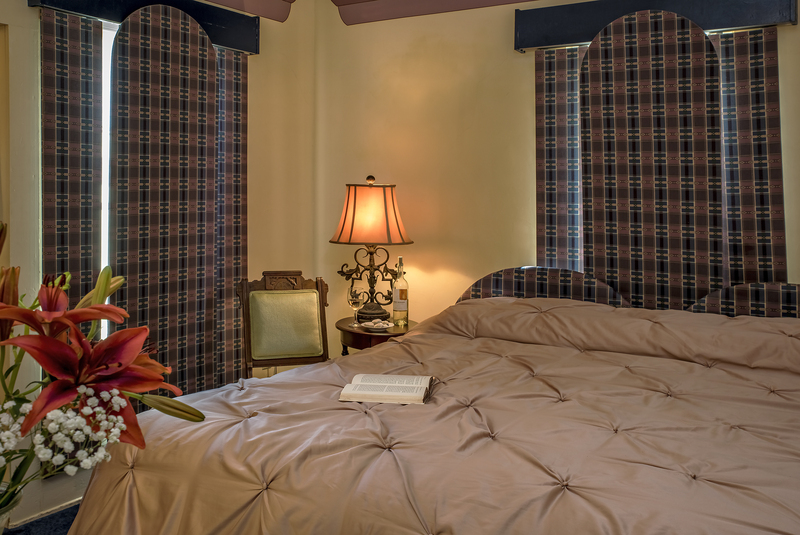 Being that Dorothy lived in the 1920’s, this room captures the art deco feeling of the period. The room is classically decorated with the round mirrors, dresser and window treatments that cast a glow over this cozy corner room. Dorothy Parker (1893-1967) represented one of the most accomplished feminists and successful literary writers in women’s history. She became known as one of the most brilliant writers from the early 1900s. Born in West End, New Jersey, and attaining her success from New York, she became one of the most brilliant writers that revolutionized American thinking then and after. Dorothy Parker lived a full and prosperous life, even though she did not have a happy childhood. Growing up, having bad relationships with her father and stepmother, she never had the privilege of growing up with a mother. Her mother died on July 20, 1897, when Dorothy was only four years of age, and her father died shortly after on December 28, 1913. Right before the death of her father was the passing away of her “brother Henry, who died on the passage home from a vacation with his wife Lissie aboard a first class steamship the Titanic, which sank in 1912.” As a sad woman, stung with depression and alcoholism her entire adult life, she had a successful and productive life. In 1916, at the age of 23, she joined the editorial staff of Vogue. Then in 1917 she started working as a theater critic for Vanity Fair, which had published her first poem entitled “Any Porch,” (1914). Vanity Fair became a significant variable in her life in that she met the associates with whom she would form the Algonquin Round Table/Vicious Circle, an intellectual and renowned literary circle. Because of unfair reasons, Dorothy was let go from her position at Vanity Fair; at which time her colleague and later her closest confidant, Robert Benchley, also resigned. Parker and Benchley then became partners in a writing firm called “Park-Bench.” At a luncheon in the Algonquin Hotel, they met an elite group of intellectuals who became part of their literary circle. Similar to the “Radical Women of Greenwich Village,” she portrayed the liberated feminist of the 1900s. The Algonquin Round Table exemplified one of her most brilliant and accomplished achievements, for this brought together the most brilliant literary writers of that time, including Robert Benchley, Robert E. Sherwood, James Thurber, George S. Kaufman, Edna Ferber, Franklin P. Adams, and many others.